Sounds Around Towne - Are All DJs The Same? What is the real difference between one DJ and another? SKILLS! What makes Michael Jordan, Tiger Woods, Michael Phelps and Brett Favre so special to their profession? Their equipment? Not exactly. It comes down to….skills! It is the same way with DJ's. 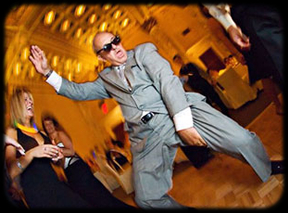 If I give you my sound system and my music library, could you develop mixes that the majority of your guests would enjoy dancing to? Notice I said “DANCING", as opposed to “LISTENING.” The object of having a high caliber DJ Company is to secure maximum participation on the dance floor. An average DJ can accomplish the feat of playing “good music” that only motivates your guests to sit and listen to the music. Due to my years of experimenting and honing my profession, you will agree that I probably can create better mixes and keep the dance floor packed. Don't get me wrong, requests are welcomed and I certainly want you to feel that your choices are also reflected in the song selection process. However, I would be remiss if I said nothing about songs that I have witnessed poor participation. A lot of DJ's put on their websites that they will play anything you want because it is “your day.” While it is true, it is your day, and you should have a say so in what music is selected, you should also respect the opinion of the professional DJ that you hired. After all, you did hire this person for their expertise just as the other wedding professionals that you hired. You should entertain your DJ's fears of some song selections.